I have a new tip for you. 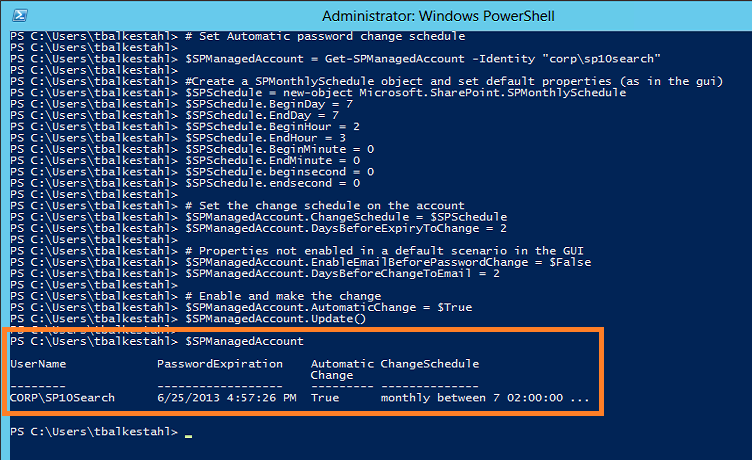 My very best SharePoint buddy asked me today how to configure the Automatic password change using PowerShell, he could not find an answer anywhere…it was a good question…seems like the answer was missing and that was when I started to do some research. *Must be executed in a PowerShell prompt running as administrator. *If used in a .ps1 script file, you have to set the execution policy first. *Replace the domain\accountname with an existing managed account. *Change the values to valid values that you want to use. Thats it, a Schedule has been set! If you want to use the GUI in central administration to find out what values to set, enable the Automatic Password change on any managed account, than set the values you want in the graphical user interface. Save them by clicking OK.
Use the values in the list in your script and you will have identical values set. Note: If you want to have a Daily Schedule instead of Monthly like in my example, you will have to modify the script to create a Microsoft.SharePoint.SPDailySchedule object instead. If you do that, you will also have to remove the lines setting the BeginDay and EndDay values, they are not used in a Daily Schedule object.